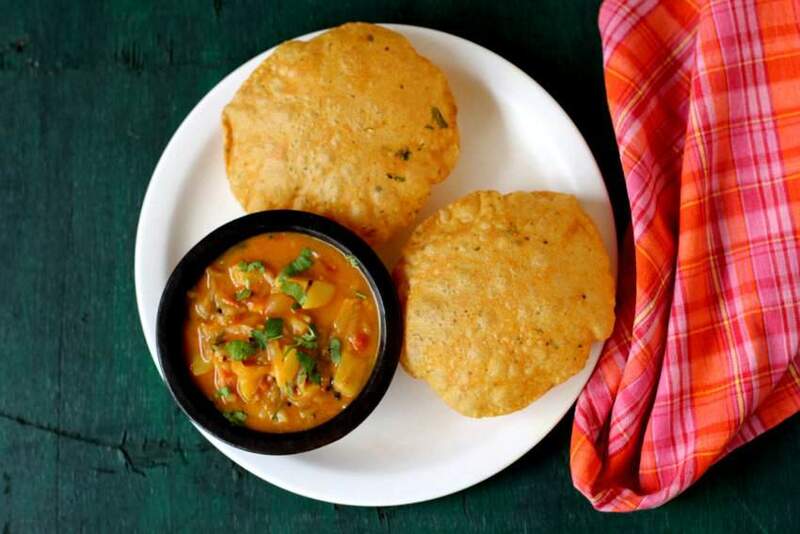 A weekend vegetarian breakfast special in our home during the winter months is masala poori with potato curry. Summer is upon us and I rarely cook deep fried food. Over the weekend, my son asked me to make pooris for breakfast and I obliged him by making poori with a twist. I made a spicy version of the regular poori which calls for the addition of Indian spices like turmeric powder and red chilli powder to whole wheat flour dough mixture. Who does not love pooris? 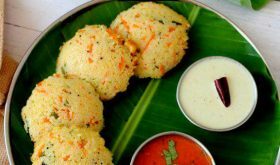 In spite of being deep fried and calorie rich, it is a comforting, vegan breakfast dish dear to us Indians. I like to make pooris for our family at least twice or thrice a month. Each time poori is prepared in my kitchen, I try different variations of the potato curry which is served with poori. 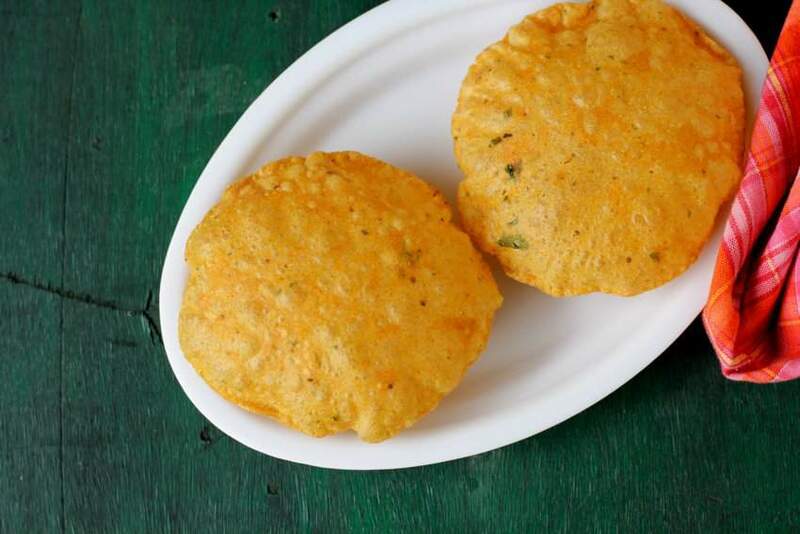 It is an easy to make spicy puri recipe that is a softer version of the crisp, Gujarati tea time snack, tikhi puri. 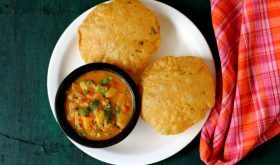 Each home cook has his or her version of the masala poori recipe. Whatever the version, turmeric powder is an essential ingredient which lends the poori its lovely yellow shade. The beauty of it is that a little kasuri methi and asafoetida go a long way. If I do not have kasuri methi or fresh methi leaves, I will add fresh coriander leaves. You can play around with the ingredients based on what you have in your pantry and fridge. The common ingredients in most masala poori variants are turmeric powder. red chilli powder and carom seeds aka ajwain. I like to add Kasuri methi aka dried fenugreek leaves and asafoetida to pep it up a bit. 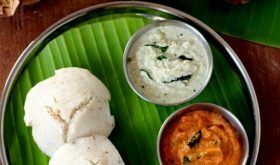 If you decide to use Kasuri methi, I’d suggest you add a little sugar to the dough to cut down the bitterness of the dried leaves. You can add green chilli paste instead of red chilli powder. Puris should be puffed up and remain like a balloon till you decide to deflate it. If you add semolina and hot oil to the whole wheat flour while making the dough, you will achieve puffed up, crisp puris. Since masala poori is heavy breakfast food, asafoetida and carom seeds help in easy digestion. Ensure that you roll out the poori dough into a thick round of 1/4″ thickness, slightly thicker than you would roll out for preparing pulka or chapati. The poori dough should not be sticky but smooth and slightly stiffer than normal chapati dough. I like to serve masala poori with a subtly spiced potato curry which is tomato based. You can serve the pooris with any pickle of your choice as well. A kid friendly. indulgent Indian bread perfect for breakfast, brunch or festive occasion. 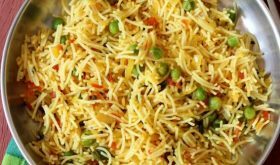 In a wide bowl, place whole wheat flour, chickpea flour, semolina, carom seeds, turmeric powder, red chilli powder, coriander powder, asafoetida, kasoori methi, sugar and salt. Add hot oil and mix well into the flour mixture. Slowly add water to form a slightly firm dough. Cover and allow to sit for at least 20 minutes. Now divide the kneaded poori dough into approx 15 portions. Shape them into round balls. Coat the working surface as well as the rolling pin with a little oil. Coat each ball with a little oil (do not dust with flour) and roll into a flat 4" round shape with 1/4" thickness. Heat oil in a heavy bottomed vessel or kadhai till hot. If you place a small piece of dough in the oil, it should sizzle up. 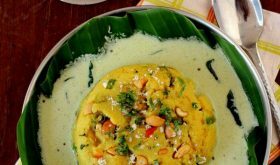 Reduce heat to medium and place a rolled puri into the oil and with very gentle pressure press with the back of a slotted ladle till it puffs up. Flip over the poori and allow to cook for a few seconds till it attains a light golden shade. Place the poori over an absorbent paper towel to absorb excess oil. Prepare pooris with the rest of the balls and serve warm with potato masala, aloo bhaji, pickle or any curry of your choice. You can add 1/2 tsp crushed cumin seeds, 1/4 tsp garam masala. 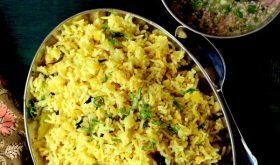 If you do not have Kasuri methi on hand replace with finely chopped coriander leaves. 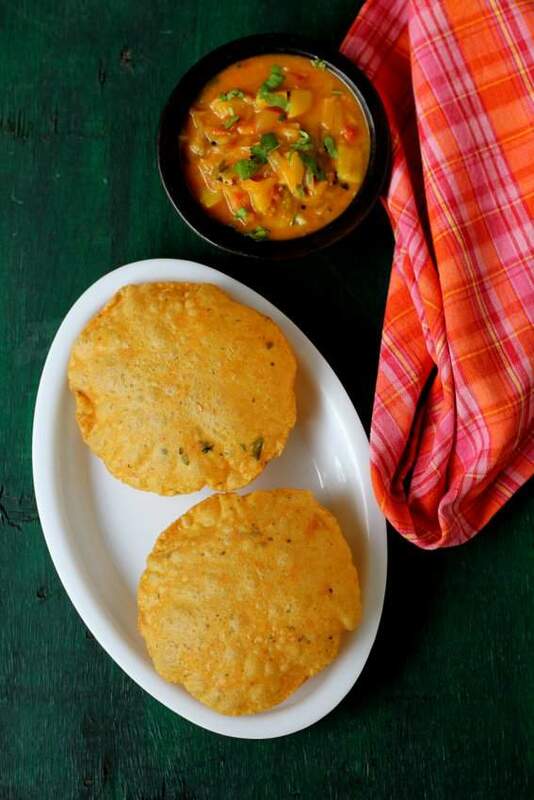 Semolina lends a crispness to the deep fried puri. Regular fan of your receipes. I liked your description in Telugu, really we all love you for your great and interesting posts. That was a nice one! Loved making d puri in a different style!